PHOTO BY JACOB GURNEY Craig Siebert of Election System and Software demonstrates how new voting equipment works at a Board of Elections meeting Thursday evening. 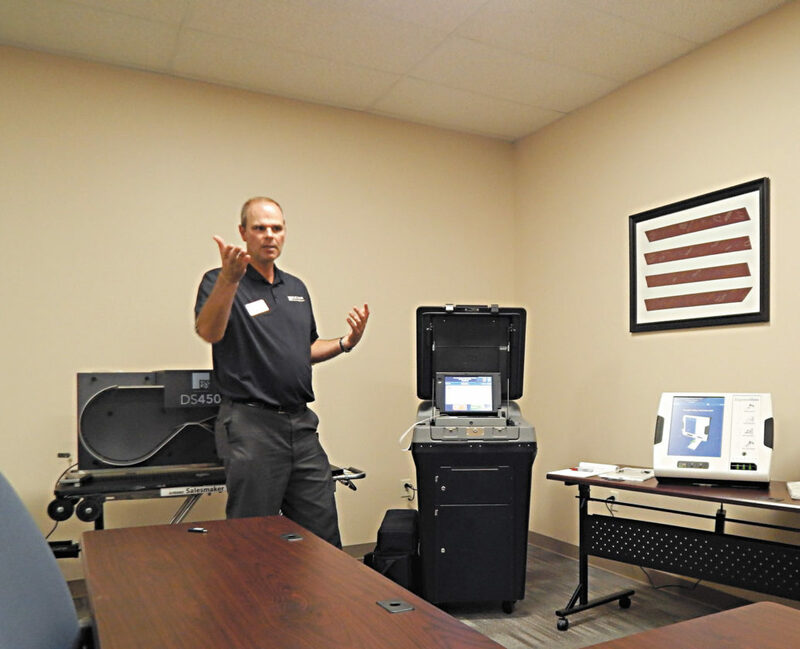 A representative from Election System and Software demonstrated how to use its new voting equipment at a Seneca County Board of Elections meeting Thursday evening. Board of Elections Director Jim Ehrman said the Ohio State Legislature approved a grant for Ohio’s counties to purchase new voting equipment, of which the county was approved for $640,000. The board is to choose the equipment for the county, but that won’t be decided until the final pricing is set through the Ohio Department of Administrative Affairs, Ehrman said. The DAA negotiates purchases for the state so each county is treated fair across, he said. Ehrman said the demonstration by Craig Siebert of Election System and Software Thursday was for members to see the company’s options. Ehrman said the board plans to meet with other companies before it chooses the equipment. “No decision on any of this is going to be made until after the (Nov. 6 general election),” he said. After the board approves the equipment, Seneca County Board of Commissioners is to have to approve it, Ehrman said. Results still would be registered on a paper ballot with the options presented at the meeting. Ehrman said he is hoping to have the equipment in place throughout the county by May so poll workers can have a couple of runs with it before the 2020 presidential election. Board of Elections Deputy Director Lori Ritzler said Dominion Voting Systems is supposed to give a demonstration on its voting equipment at 5 p.m. Sep. 25. Ritzler said the board also is to discuss the budget at the next meeting.